Wright State’s 50th anniversary celebration includes a new website ; the publication of a book on the university’s history; and a special Homecoming Sept. 29 through Oct. 1. 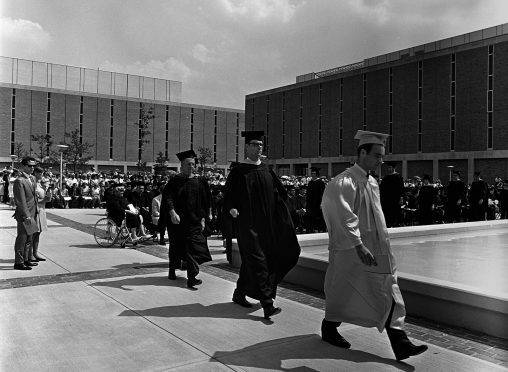 Pictured here are students at Wright State’s first commencement held on the Quad in 1968. Wright State University will celebrate 50 years of innovative leadership in affordable and accessible education throughout 2017. The celebration includes the publication of a new book on the university’s history and events throughout out the year, culminating with a special Homecoming Sept. 29 through Oct. 1, featuring multiple affinity reunions, including one for the university’s founding classes. Other key anniversary events include Presidential Lectures by former “CBS News” anchor Dan Rather on Jan. 31 and Washington Post journalist Jonathan Capehart on March 30; the University Convocation on Sept. 7; President’s Awards for Excellence Ceremony on Sept. 13; and the Employee Recognition Ceremony on Oct. 20. The university has also launched a special website — wright.edu/50th — to commemorate the yearlong celebration. 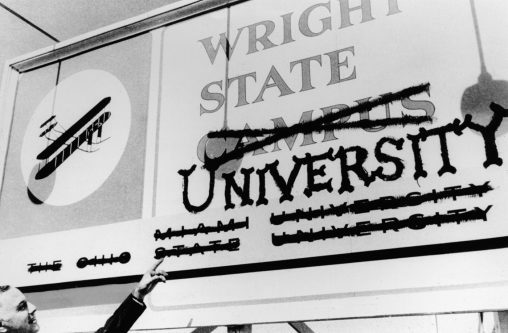 The site includes a detailed timeline of milestones and achievements that shaped Wright State and photo galleries documenting how the university has changed over the last half century. The site will be updated throughout the year with new anniversary events, news and archival photos. You can keep tabs on the website by signing up for updates. Alumni, faculty, staff and students are encouraged to participate in a project describing how Wright State has impacted their lives. To tell your Wright State story, visit wright.edu/50th/stories. One of the centerpieces of the 50th anniversary celebration will be the publication of a new book on Wright State’s history by Lillie Howard, professor emerita and former senior vice president for curriculum and instruction. Brage Golding, Wright State’s first president, pointing at the former Wright State Campus sign. Expected to be published by October, the book will discuss the major milestones of the 50-year history of the university, as well as of the years between 1961 and 1967 that led to the founding of the Dayton Campus and the founding of Wright State University in October 1967. The book will also honor friends, alumni and community partners who have contributed to the university’s tremendous growth. Howard has drawn on the university’s Archives and Special Collections and other university resources as well as interviewing numerous Wright State stakeholders. Wright State originally opened in 1964 as a branch campus of The Ohio State University and Miami University, with classes held in Allyn Hall. Three years later, in 1967, Wright State became an independent institution with 5,704 students. In 1968, the university held its first commencement ceremony. 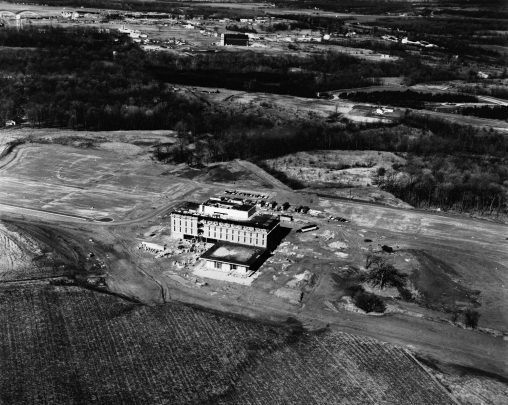 Allyn Hall, Wright State’s first building, in the middle of a cornfield in 1968. 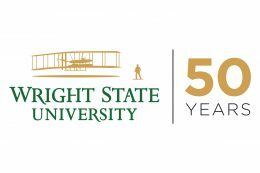 In the five decades since, Wright State has grown into an innovative leader in the Dayton region and beyond, capturing the spirit of the university’s namesakes, Wilbur and Orville Wright, who invented the world’s first successful airplane from their Dayton bicycle shop. Inspired by that same pioneering spirit, Wright State creates pathways to success for its students through diverse educational opportunities. The university is nationally recognized for its support of students with disabilities and veteran and military-connected students. First-generation college students, high school valedictorians and adult learners alike all find the support they need to achieve their dreams. The university now serves 16,000 students and offers more than 230 undergraduate, graduate, doctoral and professional degree programs through eight colleges and three schools. The Wright State alumni community is more than 109,000 strong.